Thank you to everyone who came out to our special 'Rock The Lup' BlowUpRadio.com Guitar Pull at Espresso Joe's and donated! 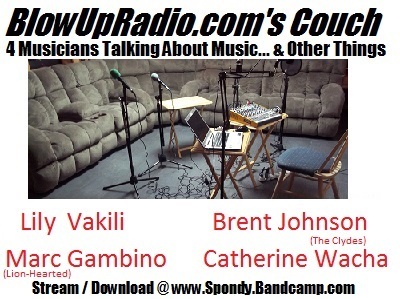 Big thanks to Catherine Wacha, Diego Allessandro, Tony Tedesco, & Wynward for being part of the show! New episodes of BlowUpRadio.com's Couch will begin in the fall. Rock Against Hate Volume 2 is now available! Rock The Lup is done for this year, but we had a lot of fun and raised a ton of money for the Lupus Research Alliance. Thank you Catherine Wacha for letting me help out this year! Summer is also upon us, and with summer comes a not unexpected lull in evening listenership, especially on Wednesdays and Thursdays. So for the summer, should I take a break from doing some of the Wednesday and Thursday evening live @ 7pm shows? If you are not on Twitter, please feel free to reply to this e-mail with your thoughts. Note that this will not affect the new music shows on Mondays & Tuesdays. Freunde. - "California" from "California"
Karen Jonas - "Mr. Wonka" from "Butter"
Red Moon Rounder - "Take Me Home" from "Take Me Home [single]"
Little Brazil - "Making A Mess (feat. Conor Oberst)" from "Send The Wolves"
Catch Me If You Can - "Save Yourself" from "Save Yourself [single]"
Gin Blossoms - "The Devil's Daughter" from "Mixed Reality"
Angie Aparo - "Sylvia Plath" from "Angie Aparo For You"
Inna Vision - "Back Trax" from "Link Up"
Midge Ure - "Breathe" from "Orchestrated"
Charlotte Morris - "Call Me Baby" from "To New York, With Love"
Chroma - "Every Word That You Just Said Was Wrong" from "No Idols"
Arthur Buck - "Forever Waiting" from "Arthur Buck Singles Pack"
Def!cit - "Short Stay" from "Short Stay [single]"
Vs - "18 Words" from "18 Words [single]"
Dokken - "It's Another Day [studio track]" from "Return To The East Live 2016"